The DIY movement has really taken off in recent years. A number of important open-source projects, such as Processing and Arduino have lowered the bar to access technologies that were once exclusively the province or professional programmers and engineers. Hobbyists now have access to the sorts of hardware that used to be found only in universities and far-away factories. In the spirit of open-source many hobbyists share their work online. We can download a wide variety of projects that we can then do ourselves. Many of these projects are very useful and practical, such as this automated, self-watering, tweeting, garden system. Some are just fun, such as this Arduino-powered Laser Tag game. But one of the great things about having all of these resources available is that we can learn on our own, at our own pace, working on the sorts of projects that we like. We don't need to become expert programmers. We just need to learn enough that we can interpret someone else's instructions, modify them to our own situation and taste and do some troubleshooting along the way. 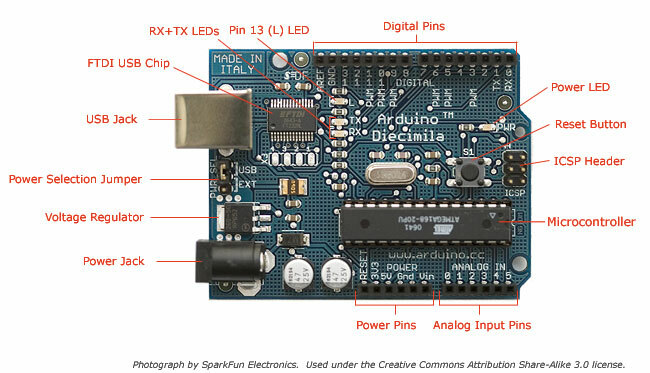 In this unit, you will explore the variety of Arduino-based, DIY projects available online. Based on your findings, you will choose a project that you would like to work on that can be done using the materials that you have available in your Arduino starter kit. It is very likely that this project idea has been implemented in different ways by different people and there should be plans available online so that you can see how each person did things a little differently. You will use what you have learned to develop this project and customize it as necessary to suit your situation, taste and skill level. How can we automate simple tasks using a microcontroller and simple electronic components. To program a computer or a robot requires us to break down each task to its simplest steps. Students will explore how we can make work easier exploring the ways in which we can program microcontrollers to work with electronic components to automate simple tasks. iv. summarize the analysis of the findings from a range of sources relevant to the development of a possible solution, cited appropriately. During this phase of the Design Cycle, we will explore what is already out there. We will look through many projects that others have posted online. We will examine these to help us decide what we are going to work on for our own project. Have a look through some of the DIY websites online to help you get a sense of what is possible with an Arduino. Some of the best sites to visit are instructables.com, Makezine.com and Lifehacker.com. There are many others. I also recommend that you look through some videos on YouTube videos to see what's out there. In particular, you should check out the great tutorial series by Massimo Banzi, creator of the Arduino. These projects are all appropriate to your skills and experience, and we already have the materials you will need. Once you have had a good look around, select 10-15 of the projects that you would consider possible, based on the limited time you had to look at them. Then, post them in the 'Brainstorming' section of your project page. You might want to do this on a chart or a concept map to show how they all fit together. In this section, you will narrow your choices down to 3. You will get some feedback and do any additional research you need to help you choose 3 that you would enjoy working on that you could accomplish given the time and resources you have available. Present each one with 3-4 sentences that explain what it is, what it does and why you think it would be a good project for you to work on. In this section, you will explain your final choice and offer some justification as to why you chose that one over the others. iv. develop accurate and detailed planning drawings/diagrams and outline the requirements for the creation of the chosen solution. During this phase of the Design Cycle, you will explore a few variations of your project idea to see how others have implemented it. This will give you a better understanding of the programming and components and help you if you run into trouble. Think of this as the difference between having a single set of directions versus having a whole map. Once you see a whole bunch of different solutions to the same problem, you have a lot more information to work with. This is where you will list the different resources that you are working with. Add some annotations to each one, explaining how it differs from the others. Here is where you present the design for how you will layout your project. It is likely that you will do it on a breadboard. I suggest that you use a program called Fritzing to help you with this. It offers a simple drag-and-drop interface to allow you to easily build your circuits and it includes all of the components that you are likely to use. This may just be one of the variations seen above, or it may be your own. It's up to you, but you should offer some justification for your choice either way. Here is where you will outline the steps. Again, this may just be someone else's work, or it may be a modified version of your own. But be sure to justify your choice. b) through photographs of the solution from different angles, showing details. Be sure to include a section that explains and justifies any changes from your original design from the previous phase of the Design Cycle. It is OK to make changes. This is all part of the process. But be sure to explain what you changes and why you changed it. This is the evidence of learning that we are looking for in your written work. And be sure to take screenshots along the way. The idea is that someone else who is at least a little bit familiar with Scratch should be able to understand the steps and create a similar project based on your information. iv. explain the impact of the solution on the client/target market. In this phase, you will reflect on both the quality of your product and on the process that you went through to develop it. Summarize the feedback that you got about the project. What did people like about it? What didn't they like? Do you agree? With a little more time, how would you change it? If you were going to release this to a larger audience, or perhaps even put it on the market, what could you do to take it to the next level? How is it helpful/useful? To what extent does it fulfil the specifications that you set at the beginning? Consider your work at each phase of the Design Cycle. How well did you manage your time and resources? Did your work at one step help inform what you had to do in the next? Were the steps that you went through helpful? Where did you do well? Where could you improve? To what extent were you successful in accomplishing what you set out to do? What steps will you take to improve the quality of your work on future projects? Massimo Banzi, one of the creators of the creators of the Arduino helped put together a series of video tutorials for a number of simple projects that people can do with the Arduino Starter Kit. You can find the first video here. Fritzing offers a software tool that allows you to create digital diagrams of your circuits.